Riley Rocks! She got the gift she was dreaming of and The Montreal Children’s Hospital got $235.50. | ECHOage - Get great gifts. Give to charity. 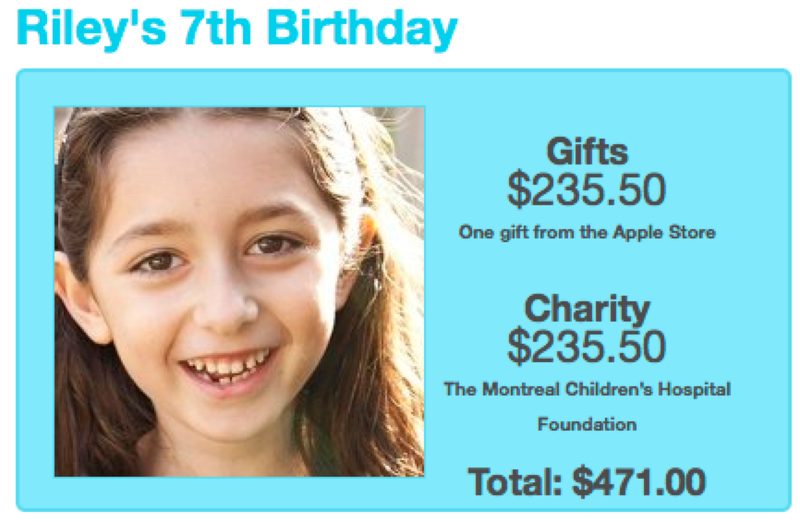 ← For Alex’s 7th birthday she got 1D concert tickets and Mount Sinai Hospital got $202! Riley Rocks! She got the gift she was dreaming of and The Montreal Children’s Hospital got $235.50. At ECHOage there are many children doing very special things with their birthdays. Seven year old Riley did something really amazing. She turned her party into an opportunity to honor the memory of her late uncle, Chucky Weiner, her Mom’s brother who was treated at The Montreal Children’s Hospital many years ago. Riley had a mission: “I want to help kids that are sick to feel better.” And when asked of her motivation: “My Mommy’s brother went there when he was a kid.” At only 7 years old, Riley has patience too. She got an iPod Touch which she had wanted for a year and a half. In Riley’s words: “It’s cool because you can load up games, and text, and FaceTime people.” Riley, thank you for what you have done. We hope your amazing contribution will echo around the world. Happy Birthday special girl! Love, ECHOage.